NetMod-DTTV - Broadcast DVB-T DVB-H DVB-T2 Modulator | AdvancedDigital Inc.
NetMod-DTTV broadcast modulator has been designed to provide a cost effective and high quality solution for broadcast network operators, system integrators and transmitter manufacturers aiming to deploy digital TV services over DVB-T, DVB-H or DVB-T2 networks in MFN or SFN environments. The NetMod-DTTV offers high grade broadcast IF and RF output level (over 42 dB in the whole band). It includes linear and non-linear Digital Pre-Correction (DPC) to optimize the transmision efficiency. It operates in MFN and SFN environments. A built-in GPS receiver can be included to ease broadcast operation. 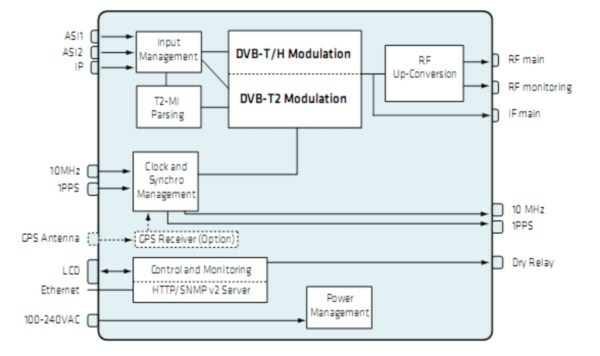 The NetMod-DTTV is fully DVB-T2 standard compliant. It supports the broadcasting in single PLP and multiple PLP. It provides T2-Modulator Interface (T2-MI) over ASI and IP to receive configuration and synchronization information from the DVB-T2 Gateway. It also supports MISO transmission to improve SFN broadcasting.